During Yoshimitsu Ashikaga&apos;s days in power, this temple held the highest status in Kyoto, presiding over the gozan temples (five great temples of Kyoto). The Hojo (national treasure), or abbots chambers, are divided into large and small ones, with Kohojo (small abbot chamber) being famed for a sliding-door painting of Tiger Drinking Water by Tanyu Kano. Whereas, the Ohojo is famed for its front garden, a dry landscape one by Enshu Kobori, commonly known as Crossing of the Tiger Cubs Garden, which is regarded as a representative work of the early Edo period. Also, the kabuki play "Sanmon Gosan-no-kiri" has an act set at the Nanzen-ji sanmon gate, where Gouemon Ishikawa stands atop the gate and utters the famous line: "Zekkei-kana, zekkei-kana"(what an amazing view). This imposing Zen Sanmon gate is one of the three great gates of Kyoto. 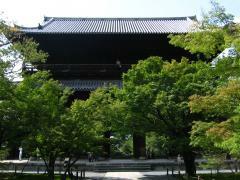 It was rebuilt in the Edo period, and is now a designated important cultural asset. As access to the upper storey requires the use of steep stairs, wheelchair users should enjoy a view of this overwhelmingly bold gate from down below. The steps up to the gate are paved so movement is easy. Take the asphalt-paved road to go round the Sanmon gate and head for the Hodo hall. The area beyond where vehicles have to stop is graveled, but close by is the flagstone path extending from the Sanmon gate, so move to this and carry on gently uphill to the impressive Hodo hall. Return to the asphalt road from Hodo hall, and then move onto the Suirokaku (viaduct), a piece of heritage testifying to the modernization of Kyoto. Of the two available entrances, take the one close to the Abbot&apos;s chambers (Hojo), as it is even, but beware of the steep incline. The weathered red-brick arches of the viaduct are unusual for a temple but somehow blend in remarkably well. The young engineer Sakuo Tanabe who designed the canal more than 100 years ago took Roman viaducts as his models for the design. The Hojo, or abbot's chambers, combines the grand abbot's chamber (transferred here from the Gosho) and remnants of the small abbot's chamber (brought here from Fushimi Castle after that castle was destroyed). The entrance is uneven and there are other steps that have to be negotiated. But, as long as you can get up them and have your wheelchair tires wiped clean, you can enter the chambers. Also, there are wheelchairs available to tour this building. Note that the corridor in the chambers also has steps, so a visit will require assistance.